Sacré-Cœur is built of travertine stone quarried in Château-Landon (Seine-et-Marne), France. This stone constantly exudes calcite, which ensures that the basilica remains white even with weathering and pollution. A mosaic in the apse, entitled Christ in Majesty, created by Luc-Olivier Merson, is among the largest in the world. The basilica complex includes a garden for meditation, with a fountain. 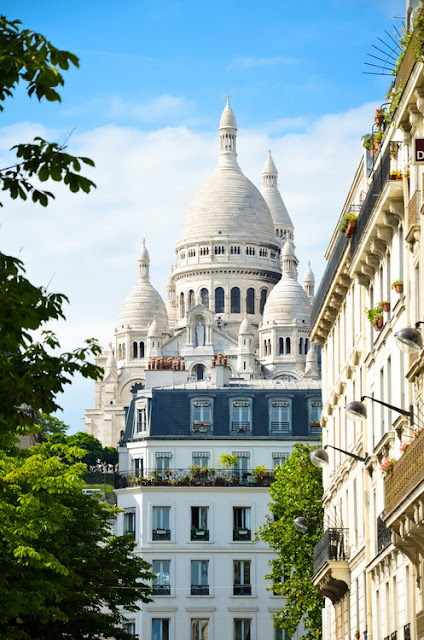 The top of the dome is open to tourists and affords a spectacular panoramic view of the city of Paris, which is mostly to the south of the basilica. The use of cameras and video recorders is forbidden inside the Basilica.